Ok, kidding aside, here’s a quick step-by-step of what I was up to this weekend. Mom and Grammy brought two boxes full of washed and carded fiber up to me on Thursday, and I couldn’t wait to spin these beautiful batts of Brittany’s fiber carded with my favorite bamboo/merino roving. Each batt weighs about 2 ounces. 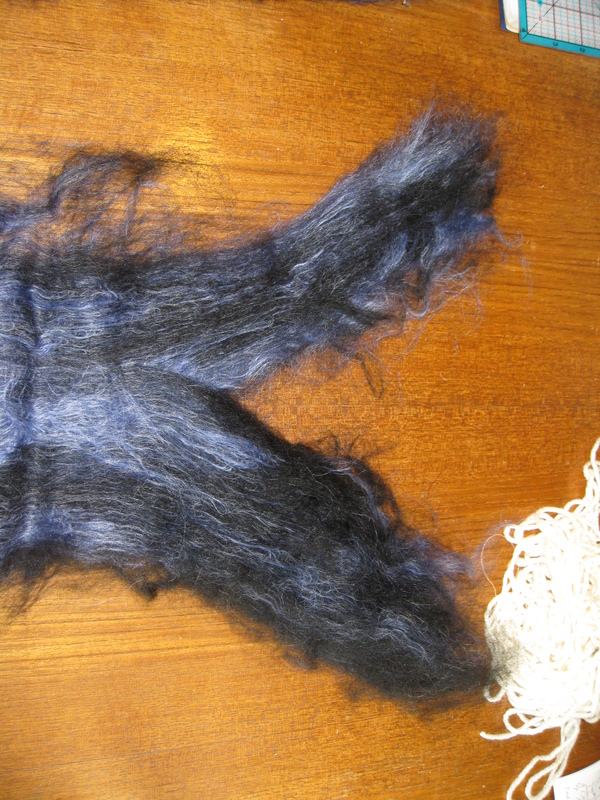 This fiber has already been lovingly (or at least tolerantly) handled half a dozen times. 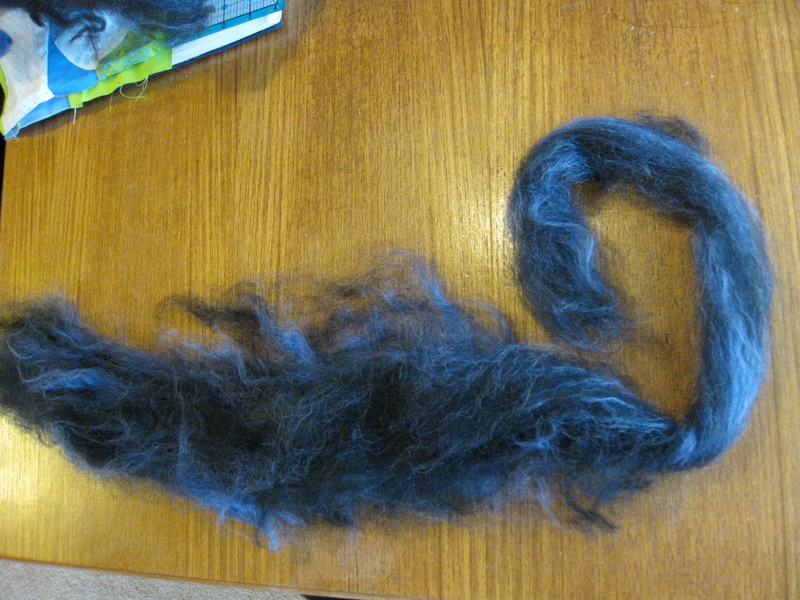 Mom and Dad have already picked, skirted, sorted, washed, and carded the fleece (details on those processes later). But I still have some work to do before I spin it. 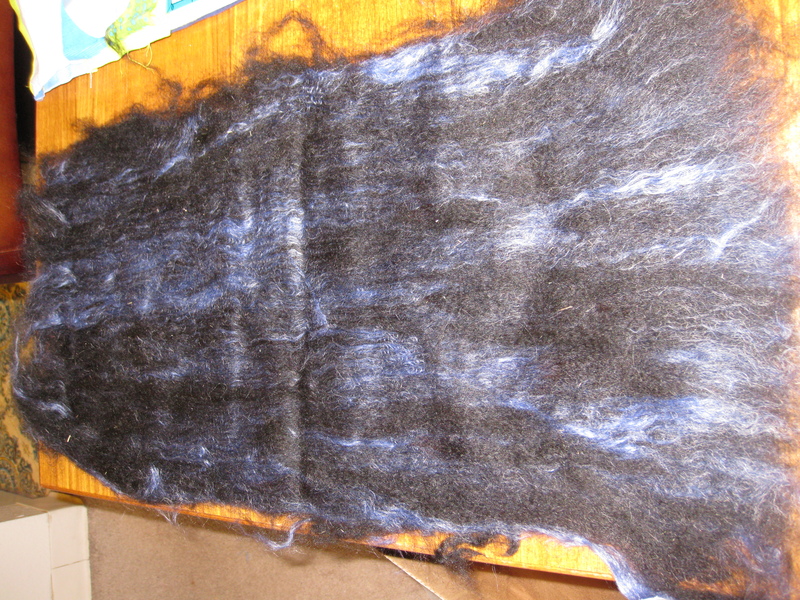 First, I divide the batt into about 5 or 6 strips. I split the batt into about six strips of fiber. These strips are somewhat disorganized still, and though I could spin them as is, stretching them out into roving makes the spinning easier. The hairs tend to line up going the same direction a little better. 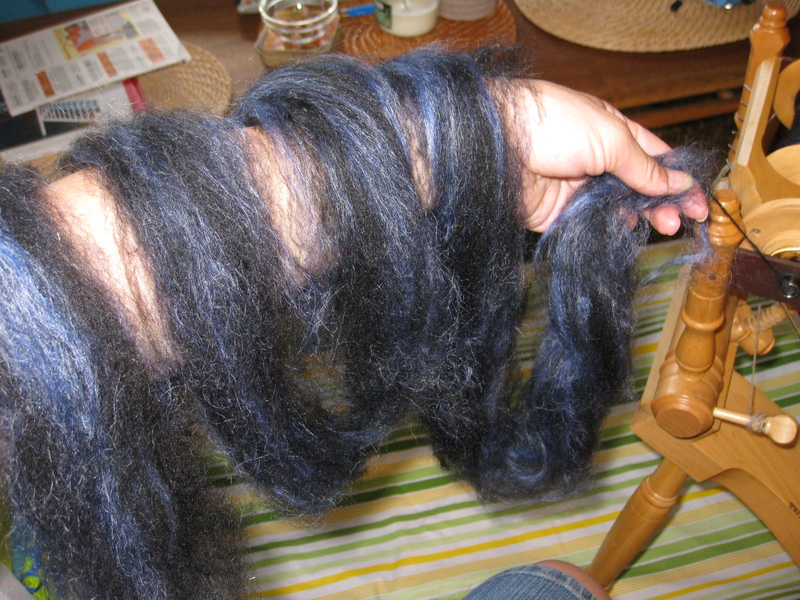 I stretch (draft is the spinning term for it) the strips into long tubes of fiber. 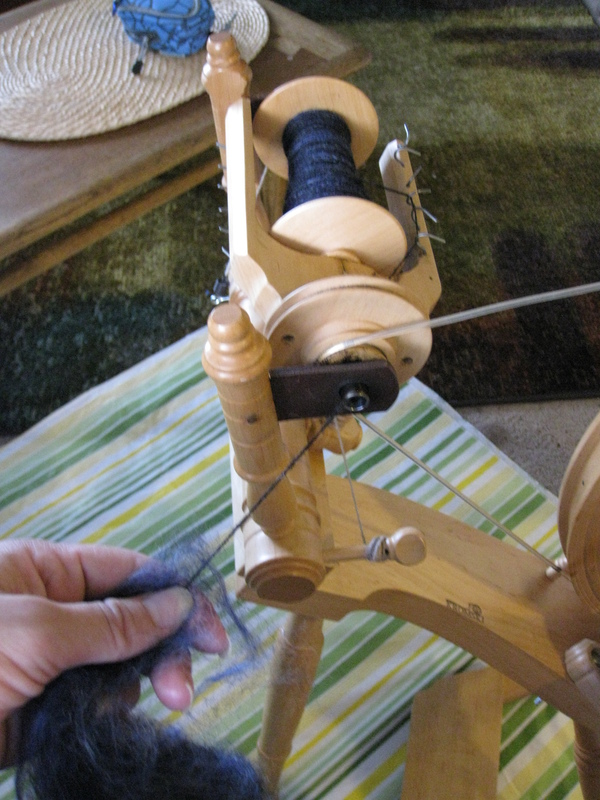 I roll all my roving into little spirals, because they stack easier. Then I take one out as I need it while I spin. I drape it over my arm, not wrapped around, but draped, so that it pulls without becoming detached from itself. Well, first I turn up the AC, since it’s a lot like wearing one very fluffy and warm sleeve. I drape the roving over my arm and attach it to my leader. Then I watch a lot of TV. Or rather, listen to about 4 hours of TV. This weekend it was America’s Next Top Model marathons. Scintillating. Must…resist…urge to stamp around apartment in heels. One full or mostly full bobbin (the one in the picture below is about half full) means I get to change bobbins! Woo! Variety is the spice of life. Once I have two full bobbins of “singles”, I ply them together, which *only* takes 2 hours! One full bobbin of singles, one to go! Anddddd…10 hours later, you have yarn! Ta da! I wanted to call this one “starless, starless night” or “the color of my soul” or “midnight dreams” or “sapphires in the dark”. Mom doesn’t always appreciate my creative naming schemes, however, so I’m going with my friend Laura’s suggestion: Purple Rain. Which Mom still may not approve of, so it’s more of a working title. The finished product: purple rain. Tomorrow: Tripoli’s first month checkup! Adorable pictures! This entry was posted in fiber art, how-tos and tagged art yarn, batts, carding, hand spinning, hand spun, roving, spinning. Bookmark the permalink. I love this yarn!!!!!!! 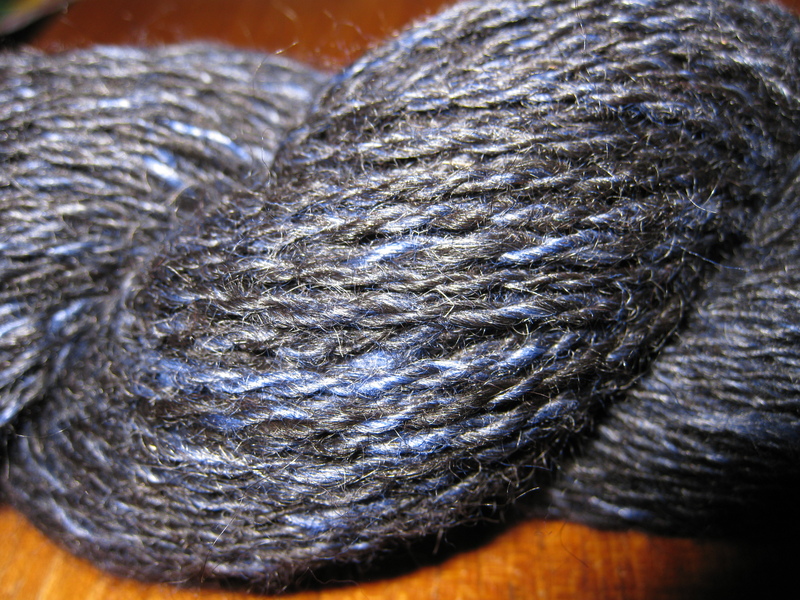 Its even more beautiful off the bobbin. I’m actually not ‘aspossed to say nothing…but I’m not entirely pleased with how it came out. I think the twist is too loose, and so the ply is kinda…eh. The color is amazing, though. And I’m sure it’s just me being too critical of myself. This website is amazing – why am I not surprised!